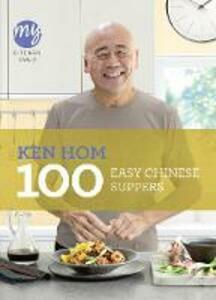 A follow-up to Ken Hom's popular stir-fries book, 100 Weeknight Chinese Suppers offers Ken's favourite quick and simple Chinese recipes, perfect for a cosy after-work meal. From stews and curries to easy stir fries and healthy steamed and braised dishes, there are also some great light bites and easy entertaining recipes. Ken Hom is the nation's favourite Chinese chef and these recipes will turn you from the take away to the wok.